Ferrari James, under jockey Berkley Packer, rallies to get the fastest time in the Iowa Gold Derby trials. ALTOONA, IA�AUGUST 20, 2016�Graded stakes-placed Ferrari James rallied to defeat multiple stakes winner and hometown favorite The Fiscal Cliff by a nose in the last of three trials for the $75,000-est. Iowa Gold Derby. The pair of three-year-olds clocked the top two qualifying times for the September 3rd final. Ridden by Berkley Packer, Ferrari James covered the 400-yard course in :19.452 seconds to earn a 99-speed index with a 10 mph tailwind. Manuel Mojica Campos saddled the IVORY JAMES gelding fifth win 10 career starts. Alfredo Botello owns the Oklahoma-bred from the Mr Jess Perry mare Ferrari Fast Prize. Bred by Weetona Stanley and W.E. Smith, the bay gelding has earned $73,541. Multiple stakes winner The Fiscal Cliff held onto the second fastest clocking of :19.455 seconds. Shawna Manriquez conditions the homebred for owner/breeder Thomas Lepic. 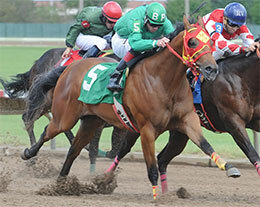 The Fiscal Cliff won the Iowa Double Gold Futurity, Jim Bader Futurity and Heritage Place Juvenile last season. He has earned $231,807. Robert Valero was riding. For the complete list of Iowa Gold Derby finalists, times, sires, dams, owners, breeders, trainer and jockeys CLICK HERE. The Iowa Gold Derby finals will be contested at Prairie Meadows on Saturday, September 3rd.